At one time, white tigers were indeed rare. The last one captured in the wild was Mohan in India in 1951. He was intentionally inbred with his daughter. 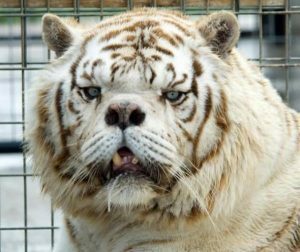 The resulting four white tiger cubs began a long line of inbreeding for profit. Fast forward to today when almost every accredited sanctuary in the U.S. has white tigers they’ve been called on to rescue. They certainly aren’t rare anymore! They sold for tens of thousands of dollars decades ago. But today, the market’s glutted with them. Why? Because of the public’s fascination with holding one, petting one, taking a photo with one – for a price. Breeders have upped the stakes now. They’ve begun cross-breeding and inbreeding different species, too. They force tigers and lions to mate, even domestic cats and wild cats to mate. Their goal? To create unique new hybrid species the public will pay to see or interact with. But what about the animals themselves? These hybrids are known for having debilitating health problems. Many die prematurely. 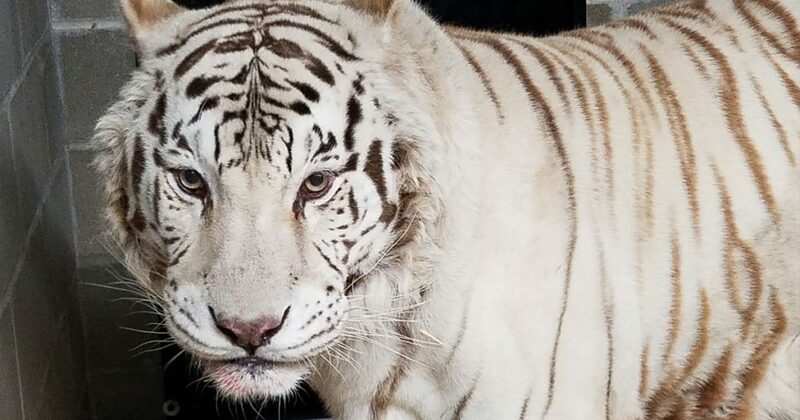 Besides the characteristic lack of color, many white tigers are also born with cleft palates, cardiac defects, scoliosis, cataracts, abnormal cranial structure, impaired depth perception, facial deformities, kidney failure and more. 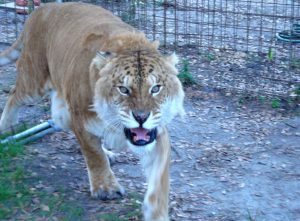 Ligers (cross-bred female tigers with male lions) often have to endure Caesarian section births since they’re predisposed to gigantism. Many don’t survive. Tigons (cross-bred female lions with male tigers) rarely survive infancy. They also suffer from neurological and physical issues. They can experience dwarfism. So many cats must be bred to produce the one money-maker the breeder’s looking to showcase. Sadly, what happens to those who aren’t marketable? In one way or another, they’re gotten rid of. How do we stop this exploitation? The Wildcat Sanctuary has joined other animal advocacy organizations in submitting a petition to the USDA. The petition details the abuse and suffering these animals endure when they’re bred like this, simply for profit. But with over 3,000 unaccredited roadside zoos all over the country, this problem has become a crisis. Their inbreeding and cross-breeding goes on unchecked. The USDA does not regulate the actual breeding of animals. Instead, they focus on issues like veterinary care and animal handling. The purpose of this petition would be to broaden the USDA’s definition of animal welfare to include breeding that produces animals at risk of defects and illness. We look forward to the public comment period now that this petition has been submitted. That’s when the general public will also be able to weigh in on this issue – FOR the animals.